Total cost? Less than $5. Despite his creation’s humble DIY origins, Kumpf thinks the idea of iPad add-ons has the potential to take touchscreens to the next level. Apple’s game-changing tablet has been put to all sorts of innovative uses by DIY modders. iPads have been tweaked and tricked out to function as arcade game cabinets, musical instruments, bicycle turn signals and other off-the-wall devices. Kumpf’s iPad piano hack is pretty neat. Starting with a prototype consisting of two or three clothespins, he has now expanded the concept to build a 15-key version. He chose clothespins because they are cheap and tend to be roughly the same size, which makes them ideal for building mechanical systems. The device essentially works on the same principle as a full-size piano, albeit with the addition of a tablet. Pushing down on one lever triggers a second, connected lever, which in turn pushes against the iPad screen, mimicking the effect of a finger on a touchscreen. Fiddlewax Pro, a music app developed by Kumpf, lets him use eight built-in instruments and four user-recorded ones. 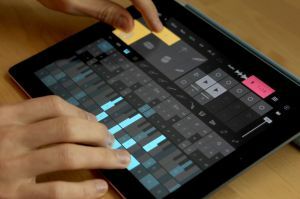 With a tap on the iPad screen, he can switch between instruments, lay down loops or record entire tracks. Adam Kumpf’s Fiddlewax Pro in action. While the clothespin piano might seem like a fun DIY hardware project (and it certainly is that), Kumpf says the experience is qualitatively different from using a regular music app on an iPad. There are plenty of advantages to touchscreens, but there’s no doubting that physical cues can be useful when using hardware. Touch typists, for example, will often use the raised marks on the “F” and “J” keys of a keyboard to remind them where to put their fingers. This is called the home row, and helps typists correctly position their left and right hands without having to look at the keyboard. A similar feature can be found on many telephones, where the numeral 5 will have a tactile cue to it. “The more you have to think about where to position your hands, the less free you are to think about whatever it is that you’re trying to do creatively,” Kumpf says. At first he tried putting two blobs of glue onto the iPad screen, to give a tactile sensation but without ruining the multitouch effect. After that, he experimented with adding knobs to an iPhone interface, essentially turning Apple’s state-of-the-art digital device into something that felt analog. 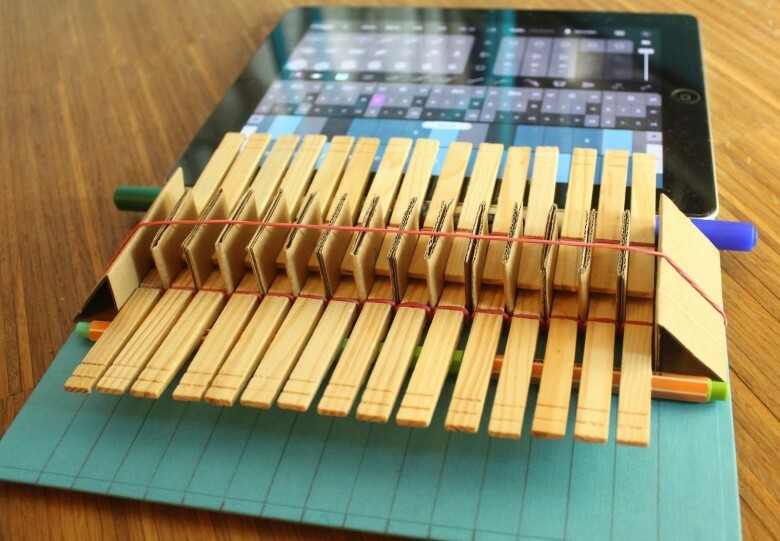 The clothespin iPad piano is the latest example of Kumpf’s continuing work on physical interfaces, an area he explored while working under Tangible User Interface pioneer Hiroshi Ishii at MIT. Ishii claims that the ultimate seamless computer interface will be one that fully takes advantage of the richness of multimodal human senses, developed over a lifetime of interaction with the physical world. Apple itself has investigated this field of touchable haptic technology, with various patents dating back several years. Meanwhile, the R&D department at Disney — a company with strong ties to Apple — revealed last year that it had been hard at work creating a haptic feedback algorithm able to simulate tactile 3-D geometric features (such as bumps) on a flat touchscreen surface. Although consumer versions of these technologies are likely still several years off, work like Kumpf’s shows that interest exists among the Apple faithful. His clothespin keyboard may be a lovably low-fi version of a physical interface, but it demonstrates a step in a fascinating — and potentially transformative — direction. If you want to build your own version of the clothespin piano, you can find the instructions here.